My cats love this! I put it together in about 20 minutes, super easy instructions! It stands about five feet three inches. Pretty sturdy for my four cats to play on. My heaviest cat is twenty-two pounds and my lightest is six pounds. It wobbles a little when my heaviest cat is at the very top but does not disturb the cats at the bottom. Indulge your cats with an assortment of scratching, climbing, and napping options using this Go Pet Club 60.5-inch cat tree. 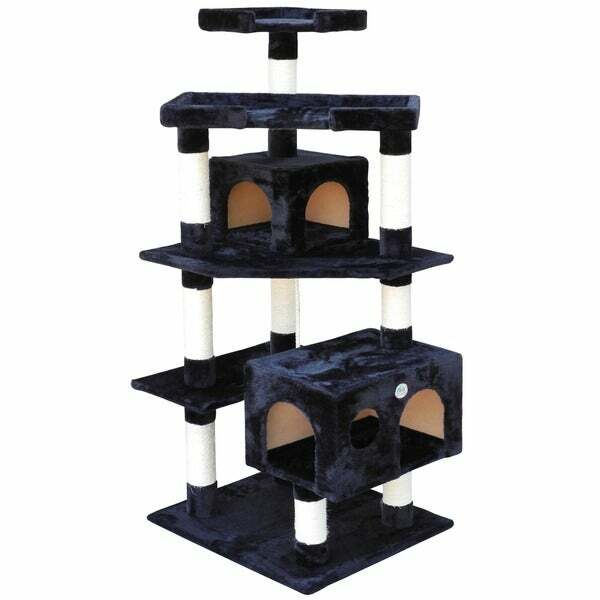 Two enclosed condo hideaways, multiple perches, and sisal rope-wrapped posts provide hours of fun for your frisky felines. The faux fur covering feels soft on your cats' feet, and this multi-level unit is designed to easily accommodate a household full of cats or kittens. I have purchased several GoPetClub towers. They smaller perches are great, however on two of my taller towers the top shelf, broke off the base when a cat was in it. The bottom underside of the post is metal, however it was not stable. Two of my cats fell to the ground. I contacted GoPetClub after the second tower broke and explained the issue, sent photos and told them I had 3 remaining towers that I was concerned about, and to spend as much as I did on their products I wanted to know if they were aware of the problem and wanted to know what they may do to correct the problem. I did receive a response, and was told to "lean the tower against the wall for stability, or purchase a larger tower." I wrote back and told them I didn't purchase a tower to lean it against the wall, and the shelves won't touch the wall anyway, it isn't constructed to do so. Buy another large tower?? my tower is 72 inches or so....what does height have to do with stability?? My cats just have further to fall. I am very disappointed in this companies response as I really like the design and color choices of their products, however they have some serious issues they need to address and take care of their customers. I will not buy their product, and hope if others have this problem they will contact them as well. I bought the cat tree in April, and it was destroyed in December. The tubes are thinner than they used to be, and a cheaper thinner rope was used. My cats had more than half of the rope off 5 of the tubes within the 8 months we had it. The top tube snapped off, and caused my cat to fall to the floor. That was the last straw and we ordered a new better quality cat tree by ********. The item isn't sturdy for multiple adult cats. If it's for a kitten, this would be a good option. If you have adult cats, look for something that's sturdier with wider tubes and thicker rope. Disappointed. My three cats have destroyed the string off the bottom - so not a long lasting cat tree. The top is where they like to perch, but not REAL sturdy. They luv it as cats, but I am disappointed in the quality. This is a very nice and sturdy cat condo. I have 3 cats, it has plenty of spaces for all of them. I purchased this item base upon the fact that it had a large platform for my cat to lay on, versus the typical small squares. However, the design makes it dangerous for the cat to descend. My cat has fallen off twice. There is no platform to jump on from the large platform, without dropping a few levels. Even the few level drop doesn't have a good place to land. I had to remove the top pole and platform, to even allow for a small space for my kitten to try and get up and down. The top box is also very small, so my adult cat hangs out both sides (even when curled up). The unit looks nice and is easy to clean, but the functionality is quite limited. Easy to assemble. I bought this tree because the different levels overlap to make it easy for a cat to get to the top without jumping. I have a one year old cat who had to have his right rear leg amputated, after being rescued from a man who cut off his lower leg, with an ax.....when he was 4 mo old. This tree allows him to get up high, even though he is unable to jump. The other cats love it too. This cat tree is solid and looks great. It went together easily. My cat really loves it. I recommend it. The double-sized platform, where two kitties can cuddle, is not easily found, so THANK YOU for this! I bought this cat tree for two kittens I am getting. It seems like it is very stable. Also I think the kittens will love it. Both of them love to climb and hide under and in things. Good overall. Best in corners. My cat likes to jump from the top and has tipped it over when it was just against a wall. My 2 furry 'kids' love their new cat tree. They challenge each other for the top spot. I had purchased a different one before and the cat loves it. So this one will go into the other side of the house. "I have two ragdoll kittens, one male and one female. They can get fairly large. I think the dimensions on this item should work for them, but is it sturdy/solid enough to handle them?" Hello thecatman, oh yes this is very sturdy. I use to have a rag doll cat also and they do get pretty big. Such cute cats! They will love this! Have a great day! no the top perches have broken off of two of my towers, and cats fell to the ground. Company was contacted and was told me to lean it against the wall or buy a taller tower...bad response for a dangerous product. How big is top? Make it comfy and bigger please. "What is the weight capacity? I have 2 fat cats"
Hello sue32937, This cat tree is so much fun for kitties! This item can hold up to 18 pounds, but the most important concern is not the weight limit, it's the size of the cats. I would recommend measuring your cats from head to tail, to see if they can fit on the cat tree. I hope this information helps. Thanks for shopping with us. "Will this fit snug in a corner?" Hello, groovyflutterby. This item should fit nicely in a corner. Thank you for shopping with us!